June 14-18, 2017 Chicago Women's Elite Cycling raced at the North Star Grand Prix—a 6-day stage race in Minnesota. The NSGP features over 200 pro and elite men and women riders from around the world. It is part of USA Cycling's prestigious Pro Road Tour. 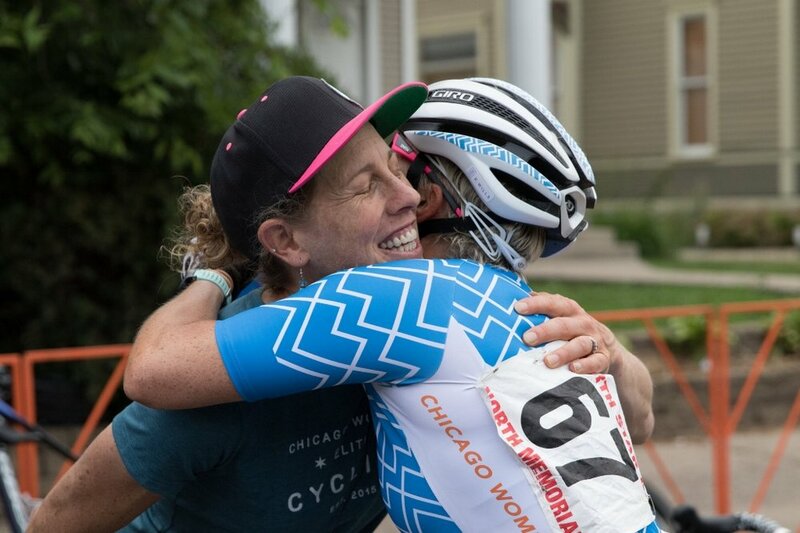 As part of CWEC's mission, we aim to provide development opportunities for Chicagoland competitive female cyclists to experience national events with teammates, support staff, experienced guest riders, and professional race direction to propel them towards success in the sport of cycling. A huge thank you to all of our members and volunteers who make this possible. Thoughts on competing at North Star with your family and friends in attendance. My Northstar experience was only enhanced by having my family and friends out each day to support me and to cheer for CWEC! My mom made the trek down from Northern Minnesota and I had my brother, cousins, aunt and uncle and many friends all stop by to see me race! I didn't start bike racing until I lived on the West Coast, so most had no idea what I was up to all these years. If you are unfamiliar with the sport, there's nothing like spectating a bike race to really experience what it's all about. Hearing my mom scream for me on Chilkoot Hill in Stillwater on the final day was pretty emotional. I'm so thankful to all who made this experience possible! Guest riding for CWEC: What were your expectations and what was the reality? I didn't know what to expect from CWEC, as I have now guest ridden on a number of teams—from club to elite to professional—and each one has a different way of going about things. What amazed me most about CWEC was the level of energy and commitment everyone brought each day and night. We were in Minnesota for six days and everyone was invested the whole time without any sort of lapse or sense of being forced. I'm also very used to doing things on my own: driving to the races, working on my bike, cooking, doing laundry, finding housing, etc. All I had to do with CWEC was race my bike and recover, and I think that really made an incredible difference this week. How was working with CWEC as Director Sportif? My week at North Start with CWEC can be summed up with one word- opportunity. CWEC provides opportunity. In one week we had the opportunity to come together, perform, and race as a team at a high level National event. The "opportunity door" was opened and the riders and the staff stepped right through. As a team, we experienced it all- race high's and race low's, off the bike laughter and challenges, fun family style dinners, team meetings to talk racing, learning, and strategy, race success, racing learning experiences, and forever life lessons. Through it all, we grew as a team, grew as athletes, and stepped up to the challenges each day. Personally, I am thankful for the opportunity to work with CWEC. The staff and organization is amazing. The riders are eager to learn and try new things. For me, every day is a chance to learn, and become a better person, coach, and team director. TELL US ABOUT THE PLANNING THAT GOES INTO AN EVENT LIKE NORTH STAR. Oh the planning! Actually right now as I type this I am working on planning for ToAD, Crit Nats, and Intelligentsia Cup. The planning never really stops and one must love cycling and logistics to keep this CWEC machine moving forward. Planning for the season started in late winter and that included a heavy focus on NSGP. Being our first big race and far from home we needed to make certain that every detail was covered. It's one thing to plan a weekend of racing solo, but to plan a 5 day series with a full team and staff is a whole other monster. We have spreadsheets upon spreadsheets, filled with timing, gear, rider information, bike information, meal plans, transportation, housing, racer registration, rider releases and the list goes on. In the early part of planning I probably spent 1-3 hours a week on it and in the 4-6 weeks prior to NSGP that went higher to maybe 3-6 hours a week and sometimes more. Countless emails were sent to staff on everything from transportation and timing to gear, as well as emails to the racers for bike information and transportation to borrowing gear. These races take a lot of focus and communication to pull off, without the help from staff and riders alike we wouldn't be able to do this. This is my second year with CWEC and I accepted the request earlier this year to take on more of a management role rather than only race day support. I'll be honest, I didn't realize how much work it really takes. I have learned a tremendous amount this year and am working on improving our program and getting to that "well oiled machine" we have made our staff slogan. We have made huge improvements and are headed in the right direction, but I have some work to do before the program is where I'd like to see it. With any young program there will be kinks to work out. CWEC relies heavily on volunteers and donations, without those there is no program. So we will continue to plan and continue to make improvements in order get to where we want to be and to "let the racers race". Typically speaking, you usually compete and train by yourself. How was it to be a member of a team and have Alison Powers directing you? Competing at North Star revealed the "team sport" element of cycling that I've been craving since I started riding bikes. It is everything I hoped/expected it would be and more. Having played ONLY team sports at a very competitive level until 4 years ago when I finished school, I'm all too familiar with teammates/coaches having expectations for my individual performance as well as overall team success—and I LOVE that feeling. Also, it was extraordinary to have someone like Alison as our coach. I think we all tried to absorb EVERY bit of information she threw at us because we have profound respect for her and her accomplishments. Plus her approach of "doing what works for you" really resonated with me, considering my training/racing philosophy is a little less regimented at the moment. Her general support and that she was willing to share her knowledge with us, combined with the overwhelming effort from everyone involved (staff, volunteers, fellow cyclists at home) gave me the confidence to know I deserved to be out there. Until NSGP, I raced because of the camaraderie, the extreme competitiveness, and the snacks I got to eat afterward ;) After being back for a few days, I've realized that now I also race because I feel like a part of something that I want to see succeed—and that's ubercool. You are the only CWEC team member who has raced at 2 large stage race events (Joe Martin & North Star). what does it takes to make it through a STAGE RACE OF THIS LEVEL? In 2016 I competed at the Joe Martin stage race with CWEC and this year at North Star. These multi day national level stage races require more planning and preparation than a one day race. They would frankly be impossible without the support from CWEC. My preparation started this winter with more training blocks and longer rest periods than I have done in the past, to be prepared for doing six races in five days. During the race and before and after, nutrition and hydration are very important. You must stay on top of them and not get behind. In addition, I focused more on conserving energy during races (staying out of the wind) than I would for a one-day race. We made sure to cool down after each stage and do recovery rides in the morning when time allowed to keep muscles from getting tight. We also tried to rest as much as we could, go to bed early, and avoid alcohol. The support from CWEC made most of these strategies easy, because they took care of our bikes, our laundry, feeding us and transportation. what you as a cat 4 racer got out of the North Star experience with CWEC? When I began training this winter, road was far from my mind. All plans revolved around gravel racing, and I didn’t expect to see a tire thinner than 700 x 34 for awhile. However, as winter dragged on and signs of a sloppy spring emerged, I began to get stir crazy. Although weekend gravel rides were enjoyable, I found myself craving new challenges to make it through the less than ideal Chicago weather. So, when registration for the local crit series Skyway Classic opened, I decided to commit to racing every night. To my surprise, I performed well. What’s more, I found the strategy, teamwork, speed, and strength involved exhilarating. Maybe pavement wasn’t so terrible after all. Shortly after Skyway, Cathy Frampton reached out and suggested I volunteer as CWEC’s soigneur for North Star Grand Prix. As a Cat 4 racer with limited road experience, I didn’t know what to expect, but my interest in road was piqued, and I wanted to learn more. Learn more I did -- my time at North Star would prove to be invaluable. I witnessed the lows and highs of racing and observed the immense physical and emotional strength of the racers; I mastered feed zone technique; I learned racing strategy; and I began to understand the tremendous amount of work required behind the scenes. In a way, bike racing is a lot like learning a language; you have to immerse yourself to truly gain fluency. Team meetings, feed zones, camp warm ups and cool downs, morning spins -- all of these moments, whether I participated actively or passively, offered me insight. I left Minnesota inspired and eager to apply and share what I had learned. I’ll be forever grateful to CWEC for this experience, and I can't wait to volunteer again. What differences Do you encounter competing as a cyclist vs a triathlete? As a triathlete since 1992, training and racing came as a norm to me. It was natural, part of my daily world training for triathlons. Yes, I pushed myself at times outside of my comfort zones but it has been a sport that I had a lot of experience in and have been immerse in for many years. As a coach, I continue to tell my athletes that the unknown is scary and uncomfortable, but that is what is so great about being an athlete, testing your abilities and stepping outside the comfort zone. Once I moved up to a Cat 2 and raced Intelligentsia Cup, where the fields are much stronger and the number of riders are much greater, the importance of race strategy, positioning and bike handling was so much more important. It was an honor being on the same race course as some of top cyclists in the US along being a guest rider of CWEC. The support and experience was amazing and I am changed because of it and forever will be grateful for the opportunity! Please send your healing thoughts to CWEC rider Annie Byrne who crashed in Stage 2 of NSGP but is going to make a speedy and healthy recovery! Any gifts or cards can be send to BFF Bikes at 2113 W Armitage Ave, Chicago, IL 60647.